Your children have been asking — begging — for a trampoline for many months now. You’ve been thinking an in-ground trampoline might not be a bad idea or investment because you could use it for your own health reasons as well. After all, you know you should be getting more exercise, but running or going to the gym is too hard on the muscles and joints. Here are 5 things to consider when buying a trampoline, not the least of which is whether you should get an above ground or an in-ground model. Trampolines are not just for children any more. Many adults who want to get in shape but don’t want to risk injury from running or if getting to the gym for a workout is out of the question, are finding that a trampoline is great exercise! 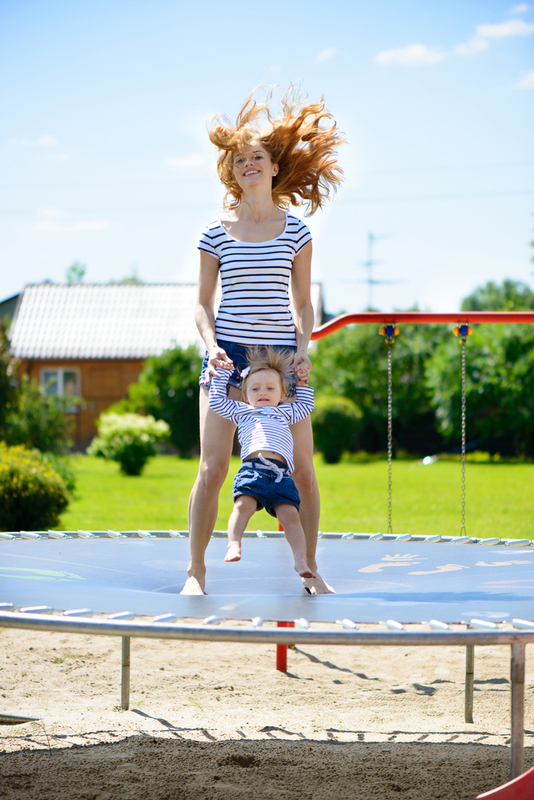 We’ve put together a list of considerations before you invest in a trampoline for your family. Will it truly get used? You know how it goes — the family says they will use it every day… but will they? Make certain they really want one and make certain you will use it for your rebounding workouts. We bet that once you get it, and it’s in your yard, it will get used more than you imaged it would. What shape? Trampolines come in two shapes: circular or rectangle. The circular style is the traditional shape you see in backyards. They are also less powerful than you will see if you go to a trampoline park or that you see gymnasts using. With a circular trampoline you are driven toward the center when you rebound, and that is definitely safer. What size? We know that you know only one person at a time should be on the trampoline, but we also know that not everyone adheres to that rule. You certainly don’t want the entire family jumping on it at once because someone will get injured. The size of the trampoline is more a matter of where you will put it and how much yardspace you want to devote to it. What is its longevity. 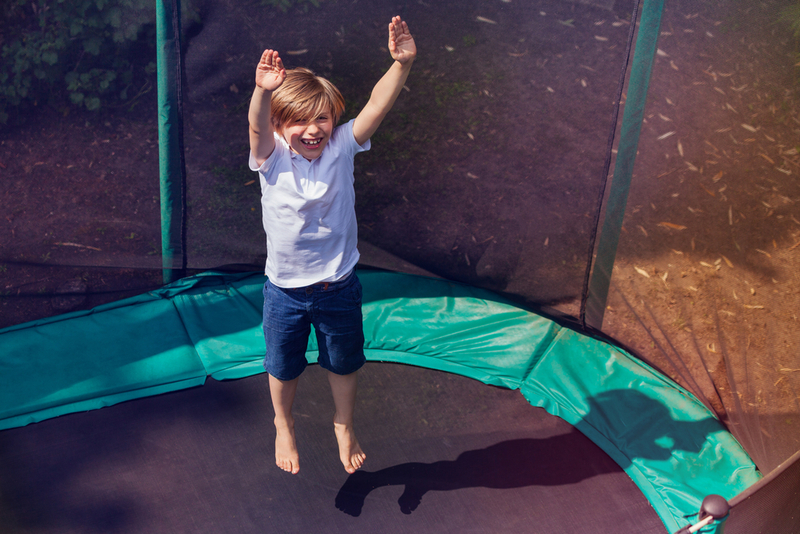 With care and cleaning and using a cover when you’re not using the in-ground trampoline, it can last for many, many years. You will want to jump on it in barefeet or wearing trampoline socks. You will want to cover it when not in use and you will want to clean the jump mat. Where to get it. You can certainly buy a trampoline from a big box store, but we don’t recommend that. 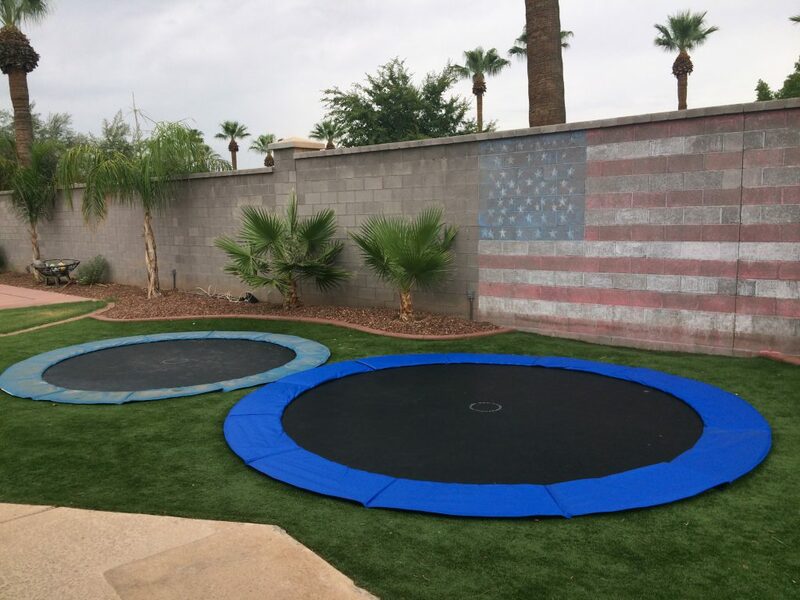 You want to buy an in-ground trampoline or an above ground trampoline from an experienced professional who stands behind his craftsmanship and the quality of the materials. Look for a trampoline supplier that uses Made in the USA products and who sells high quality materials. Ask about guarantees and warranties as well. When you’re ready to buy an in-ground trampoline for your family, give us a call and ask us for advice on the right trampoline for your family. 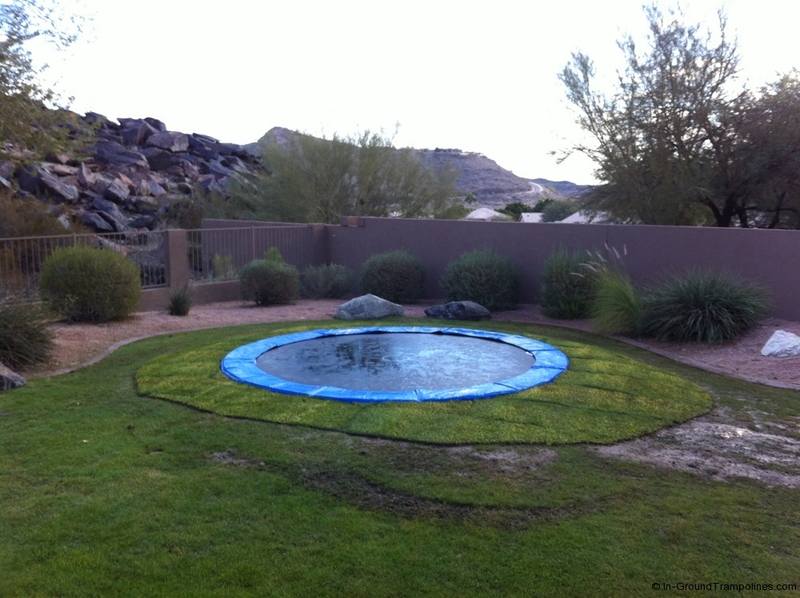 There are many things to think about when you’re buying an in-ground or an above ground trampoline. How does air flow impact my trampoline may not have been one of them, but it is something that we think about and discuss with our customers. What do you think about when you’re planning to invest in a trampoline? Should I get an in-ground or an above ground trampoline? What accessories do we want with our trampoline? Will we do the installation of the in-ground trampoline ourselves or ask for help? What you do already know about having a trampoline is that they are fun! Trampolines also offer a way to get in shape in a healthy way and in a way that won’t lead to injuries! What is air flow and what does it mean to your in-ground trampoline project? Air flow is very important for any trampoline system. If there isn’t proper air flow the “bounce” will not be what you want it to be. Without proper air flow the bounce will be diminished because proper air flow leads to better bounce. Because we understand the importance of proper air flow, we have designed a spring pad that allows the air to flow around the inside and the outside of the spring pad. When you jump on a trampoline, the pad lifts slightly, and no air escapes. When you land, the air flows between the in-ground trampoline pit and outside of it. In 2015, because we understood the importance of air flow to the experience of your rebounding on an in-ground trampoline, we introduced a high performance, anti-slip, jump mat. This jump mat has 15X greater air flow. The air flows between the springs and the jump mat’s surface. This increase of air flow gives the trampoline a bigger, more high performance style bounce. This means you bounce higher and land softer. If you’re thinking of adding an in-ground trampoline to your backyard for your children or for your own exercise routine, give us a call and make the investment in our complete In-Ground Trampoline system. Even if you’re not a fan of walking barefoot out of doors there are myriad reasons why you should jump barefoot on a trampoline. Wearing shoes on a trampoline is also a recipe for a rip or tear in the jump mat especially if you have buckles or even shoelaces on your footwear. When you’re on a trampoline, the benefits of being barefoot may be a feeling you haven’t experienced in quite sometime. If you have children or grandchildren you may watch the way they dash around the yard in the summer barefoot and fancy free and wish you still did that! Even if you don’t want to join them in the yard, you can certainly be a member of the “ditch the shoes” crowd when you’re on the trampoline. When you’re rebounding aka jumping on an in-ground or an above ground trampoline you are being more of a part with nature and more in touch with your own body. When you were a child, your feet were probably as “tough as shoe leather” because you were constantly barefoot until you went back to school, right? Today, though because we wear shoes all of the time, our feet aren’t able to withstand walking on hot surfaces like a sidewalk or walking on a pebble without a wince of pain, right? For many of us, even walking on a sandy beach may feel uncomfortable because of the grains of sand and the heat of the sand. As installers of in-ground and above ground trampolines, we always tell our customers that we recommend trampolining barefoot because you don’t want to case any damage to the trampoline’s surface and jump mat. Feeling the mat beneath your feet will give you better balance. When you walk barefoot you are helping enhance your vestibular system — the part of your body responsible for your balance. This is an important sense and health concern for seniors who are more prone to slips and falls. Your health starts from the soles of your feet on up. Diabetics run the risk of foot issues and overweight are at risk of developing diabetes. When you keep your feet healthy from when you’re young, you may have better health throughout your lifetime. Barefoot walking and barefoot trampoline jumping stimulates your nervous system and this improves your immunity. Going barefoot will help strengthen you, enhance your balance and when you’re barefoot and jumping on a trampoline it is just fun and you’re more in touch with the act of rebounding.